Detail : In 1973 E.M.I. (under the Apple banner) released two double albums of the "Best" of The Beatles, The Beatles 1962-1966 and The Beatles 1967-1970. The package of this release has the catalogue number PCSP 718, but the two albums are individually numbered as PCS 7181 and PCS 7182, which actually fits in with the Parlophone numbering of the time. The album was also released on cassette tape, Catalogue number - TC2 PCSP 718. The C.D. of "The Beatles 1967-1970"
This set had a catalogue number of BEA CD 25/12, and was in a limited edition. 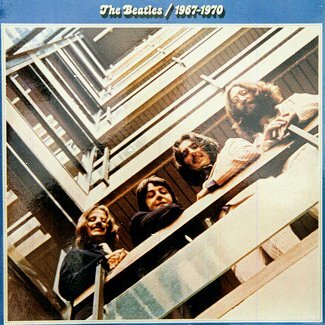 This "Blue Album" narrowly missed out though, when on 21st October it went from 181 to 91, but didn't get into the Top 75. It was again listed in the top 100 on 11th November 2007 when it went from 112 to be at number 98. Catalogue number: BLUE6770 (Barcode: 5099990674723). 24th October 2010 - The Blue album re-entered the charts at number 4. 31st October 2010 - The Blue album dropped down 12 places to number 16. 7th November 2010 - The Blue album dropped another 12 places to number 28. 14th November 2010 - The Blue album dropped another 8 places to number 36. 21st November 2010 - The Blue album went back up the chart to number 32. 28th November 2010 - The Blue album went up again in the chart to number 29. 5th December 2010 - The Blue album dropped back to number 32. 12th December 2010 - The Blue album dropped back another place to number 33. 19th December 2010 - The Blue album dropped again to number 34. 26th December 2010 - The Blue album was a non-mover staying at number 34. 2nd January 2011 - As Christmas sales dropped off the Blue album dropped way back down the chart to number 70. 9th January 2011 - The Blue album dropped out of the official chart, down to number 85. 16th January 2011 - The Blue album dropped to the bottom of the Top 100 to number 100.